Reflexology is best described as a ‘guided’ foot massage. It’s like having a normal foot rub, only you know which specific parts to stimulate to get the best result. Just like how back rub improves blood circulation, foot reflexology massage also ensures blood is freely flowing from the blood vessels in the feet towards the heart. Blood circulation is essential because metabolism and elimination of body wastes rely on it. 2. Relieves stress and anxiety. Do you feel like the world is weighing you down? If yes, then foot reflexology may provide the relief you’re looking for. According to London-based reflexologist Rosanna Bickerton, being in a state of anxiety is like putting all the energy to your head, depriving the rest of the body of the energy it needs to function well. With the help of reflexology foot massage, the parasympathetic nervous system is triggered, thereby stopping the “fight-or-flight” response and allowing the body to start the healing process. 3. Improves the body’s metabolic and respiratory functions. By stimulating the reflex points connected to lungs and organs responsible for metabolism, foot reflexology can indirectly improve your health. This can be manifested through improved breathing and metabolic functions. Disorders affecting these specific organs may be prevented as well. 4. Strengthens the body’s defenses. There are many ways foot reflexology can improve your immune system. Both the spleen and lymphoid organs are part of the immune system, and stimulating them through reflexology may boost their functions. Different cells of the body are also enhanced with each reflex point you touch, and this contributes to the overall improvement of the immune system. Massaging areas linked to the head may help reduce pain associated with migraines and other forms of headache. The same principle applies to other areas of the body. However, it’s best to ask the opinion of medical professionals first to ensure you’re not overlooking anything that may require serious medical intervention. Reflexology foot massage calms your nerves and relaxes your mind. For this reason, it can be a good alternative treatment to help you establish good sleeping patterns. It’s not unusual to see someone dozing off a few minutes after receiving foot massage. 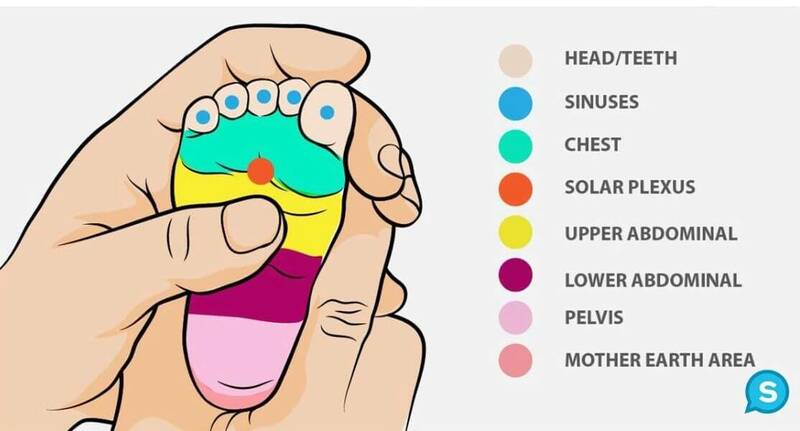 Since reflexology works under the principle that each organ is connected to sensory nerves, this massage may help in the overall improvement of the nervous system. Through stimulation of the reflex points, the nerves are revitalized, resulting to a smooth transmission of impulses to the central nervous system (CNS). 8. Restores balance in your body’s energy. In reflexology lingo, Chi refers to the total energy that freely flows in your body. When you’re sick or experiencing pain, it means the balance has been disrupted. This energy is composed of the positive (Yin) and the negative (Yang). Balancing the two will restore your energy and health. Foot reflexology, by stimulating meridian points, is one of the most effective ways to achieve this balance. Our Reflexology workshop is ideal for anyone who has an interest in Reflexology and wants to learn about this ancient therapy. No experience necessary.